Toronto's College Street bar district has seen its share of late-night fights, but a recent scrap was a bit out of the ordinary, as a financial journalist in a '50s housewife get-up tried to wallop the daylights out of a 35-year-old part-time waitress -- using a pillow. 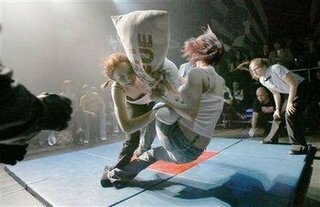 The league is the brainchild of 38-year-old Stacey Case, a T-shirt printer and musician who came up with the idea that people would pay to see young women in costumes beat the tar out of each other with pillows -- and that women would volunteer to whap each other in front of a crowd. The seeds of the idea came from a New Year's Eve show Case's band played in a Toronto bar just over a year ago. As a local burlesque troupe entertained the crowd by staging a mock pillow fight, they were shocked when women from the audience came forward looking to join the battle. "It was really, really fun, and really funny that they were actually fighting for real. I woke up the next day, and I was like, "Oh my God, that was awesome," he said. "People all have a conception in their head of what a pillow fight is all about," says Don "The Mouth" Lovranski, Case's co-investor and the big-voiced announcer for the shows. "When they come to it, though, they see it's not hot blonds in negligees; the fights are real, and there's some fun to it. I think that's what the appeal is." The rules are simple: women only, no lewd behavior, and moves such as leg drops or submission holds are allowed as long as a pillow is used. After that, it's up to the combatants. For the fighters, there's a small stipend, and a chance of fame if the popularity of the league continues to grow. But it's also a hobby, and maybe even has a therapeutic appeal for players like Polly Esther, who got her snarky waitress persona the hard way, during 20 years of waiting tables. "All the people I've served over the years, the bad customers, the bad tips, Polly doesn't take it." she says. "She lashes out. She hates everybody, but she's not going to leave her job." The cheers reach a crescendo as Betty Clock'er fights off Polly Esther's roundhouse hits, then unleashes a well executed pillow-leg takedown and pins Esther for the three-count. "I'm prepared for it to tank," says Case. "But I hope it doesn't." An escaped chimpanzee at the Little Rock Zoo raided a kitchen cupboard and did a little cleaning with a toilet brush before sedatives knocked her out on top of a refrigerator. The 120-pound primate, Judy, escaped yesterday into a service area when a zookeeper opened a door to her sleeping quarters, unaware the animal was still inside. Keeper Ann Rademacher says Judy went into the bathroom, picked up a toilet brush and cleaned the toilet. Rademacher says the 37-year-old Judy was a house pet before the zoo acquired her in 1988, so she may have been familiar with housekeeping chores. Judy wrung out a sponge and scrubbed down the fridge. The zoo veterinarian gave Judy a drug to bring her around. Rademacher says Judy was groggy but fine after the episode. 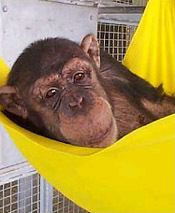 The zoo says there was no danger Judy would get out of the primate keepers service area and onto zoo grounds. A 46-year-old German motorist driving along a busy road suddenly veered to the left and ended up stuck on a railway track -- because his satellite navigation system told him to, police said Sunday.